Happy Saturday my friends! I hope you all have a lovely start to your weekend today. This month’s theme at a Blog Named Hero is monochromatic. My ideal colors to use for this would be like aquas and teals, periwinkles and navies and blushes and corals. But I decided to try and push myself a bit outside of my comfort zone and use some neutrals for the monochromatic card. 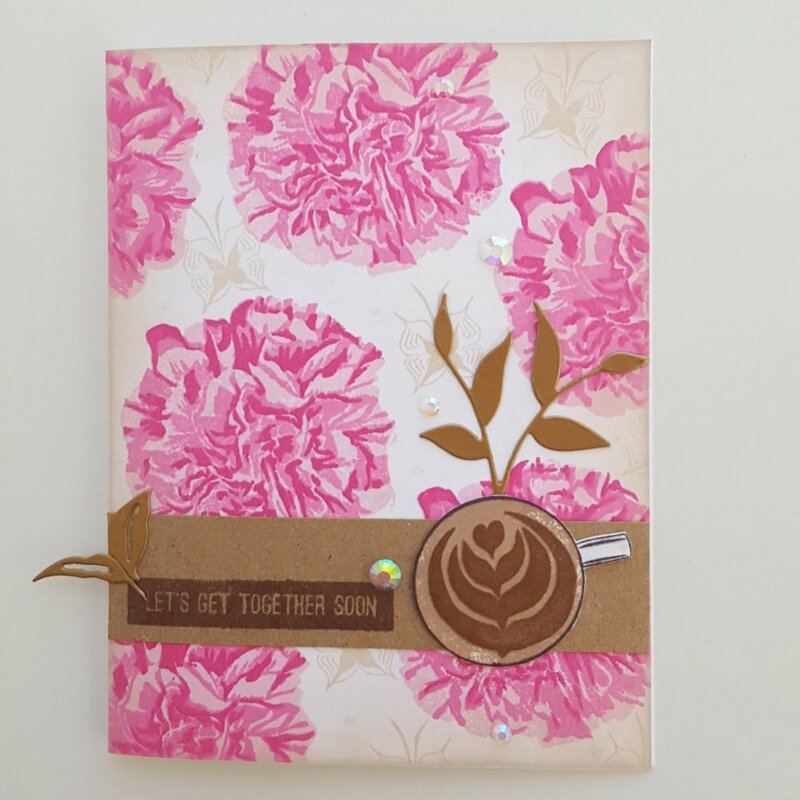 I started with Kraft cardstock, and used the Besties Stamp and Cut with varying shades of brown. I started with the round stump and used a pale brown ink, and used a dark brown with the leafy twigs, and then the darkest brown for the smallest leaves to fill in my background. This helps give contrast to my background without being too busy. I then did some ink blending with gold and copper metallic ink on the bottom third of the panel. 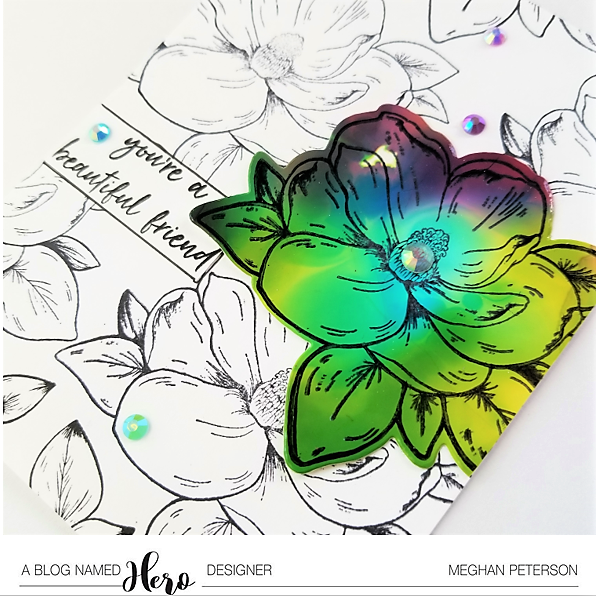 This lightened the stamping a little and added some subtle shimmer to the card. Over the lighter part of the panel, I die cut the word “love” from the Love Stamp and Cut set from gold for my focal point. 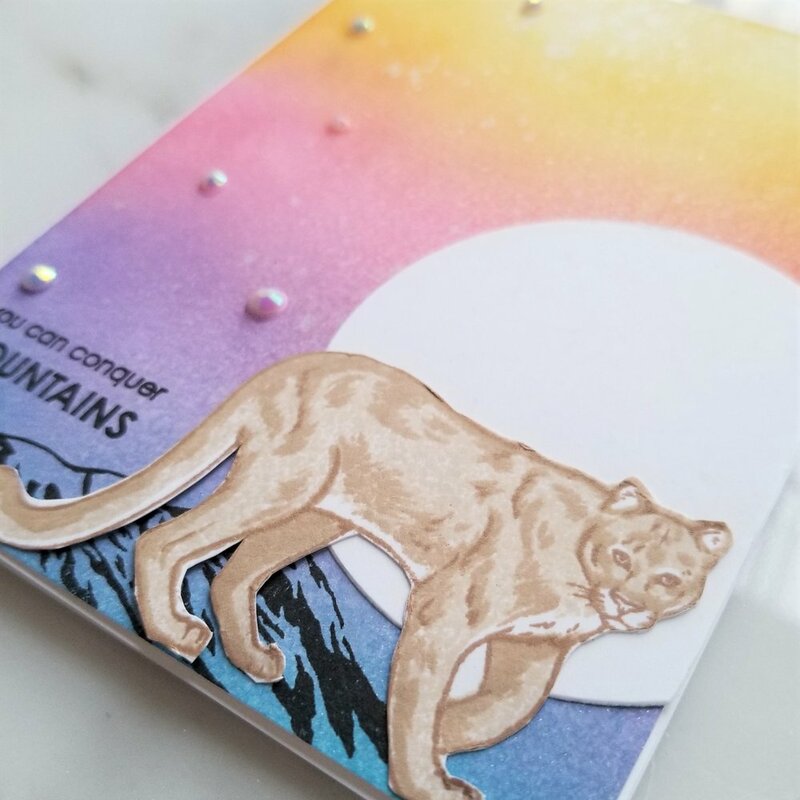 After I stamped the sentiment “U + ME” under the love, I thought about adding some gems or sequins, but I actually really liked the subtly of sparkle and the earth tones by itself. I stamped our sentiment in black because I thought brown would get lost in our background. Otherwise this is an all brown card! Whew. And it actually looks super classy! I can’t wait to see what you do with this challenge, what a great one! Thanks so much for stopping by! Birthday Cards Using Background Scraps! Hello! Hope you're having a good weekend! 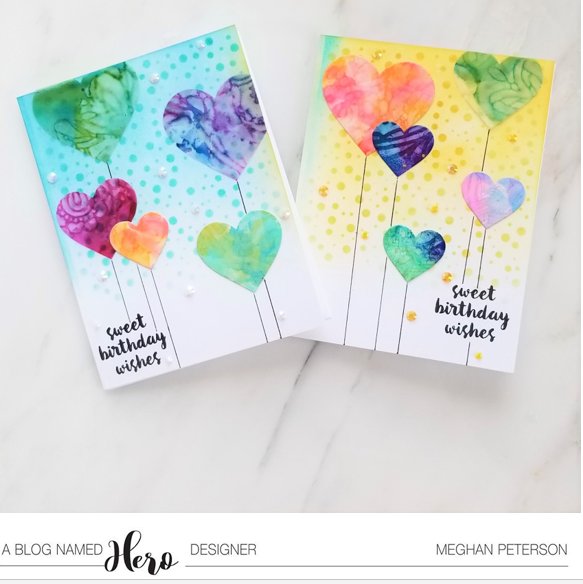 This month's challenge for A Blog Named Hero is Birthday! 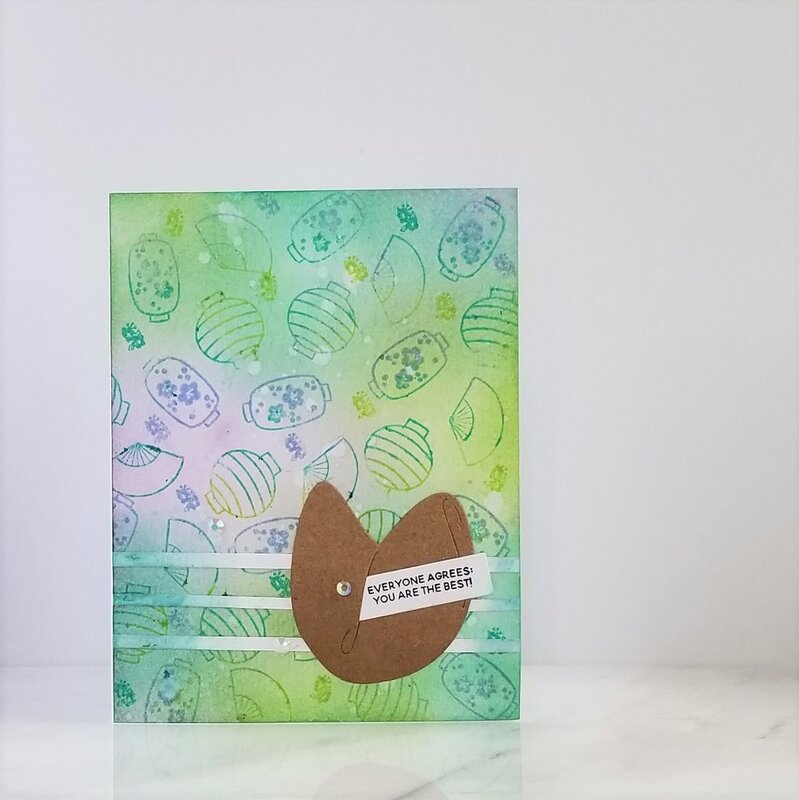 I love to make watercolor and alcohol ink pieces and die cut them or cut them down to use on my cards. I hate throwing away those beautiful colorful scraps, so I keep them and die cut small shapes out of them. Sometimes they're just strips, and I use them as stripes or die cut edges on them to create a new look But today we'll be using pieces that use dies small enough to cut shapes from them and use many of them to create a card. After I made all these alcohol ink and watercolor pieces, I couldn't bear to throw out the pretty scraps - I'm sure many of you know what I'm talking about! So I die cut all of them using various small heart dies from the Hero Arts Nesting Hearts Infinity Die Set. 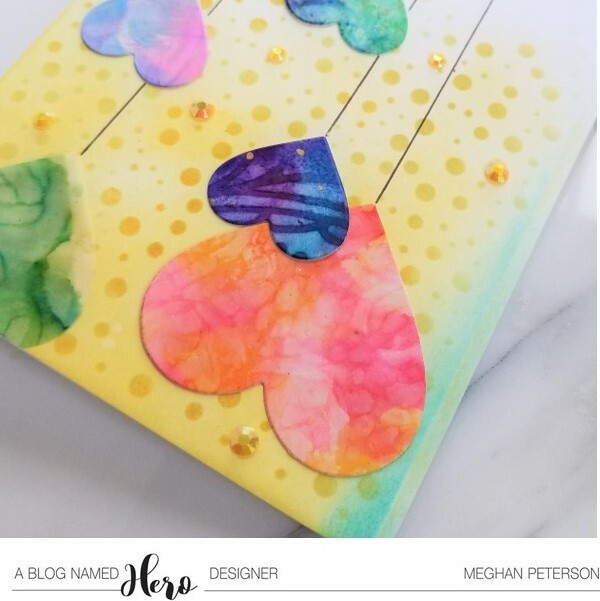 And I'm using them today to create our own heart balloons, and they're pretty multi-colored look will make them great focal points. For the look of confetti in the backgrounds of our balloons, I die cut the Hero Arts Circle Confetti Fancy Die from scrap paper to make my own stencil. You could also use post it tape or something with temporary adhesive, but sometimes I just use scrap paper haha. I put a light blending of Tumbled Glass distress ink blue 2/3 down my card, and a light blending of Squeezed Lemon distress ink yellow 2/3 down my other card. I did this before I cut apart of my 8 1/2 x 11 paper and this allowed some bit of yellow on my blue panel and a bit of blue on my yellow panel and I love the way that turned out. Then using my makeshift stencil, I put heavy amounts of the same color family to make my confetti. This gives us a nice subtle background that won't distract from our pretty balloons. Then I took 5 hearts of varying sizes and arranged them on my panels and glued them down when I was satisfied with their placement. Using a T-ruler, I drew black lines from my balloons for their strings. I then stamped this sweet sentiment in vivid black at the bottom portion of the panel, from a great stamp set called Color Layering Ice Cream Set. I added white gems to my blue panel and yellow gems to my yellow panel for some shines and more confetti. I think if I did these again, I'd put blue gems on my blue panel, the white gems get a little lost to me. And our cards are done! Thanks so much for stopping by and I hope you have great fun making birthday cards from those pretty scraps you make! 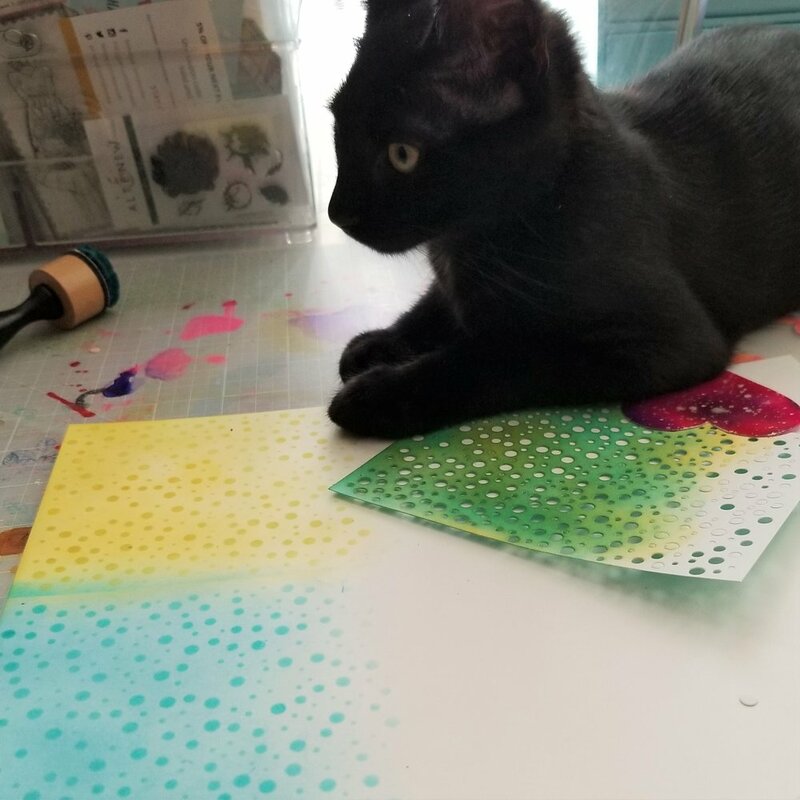 And below I have in-process pictures of my cards that are really just an excuse for me to show my new kittens and how much they interfere with my artistic process lol. They are the cutest distractions ever. Meet: Mocha and Toast! Have a great day and enjoy the kittens! Hello again everyone and welcome to another ABNH Challenge! This theme is super fun - Summertime! Summertime can mean so many things - flowers, the tropics, ice cream, the ocean, poolside, sunshine, etc. 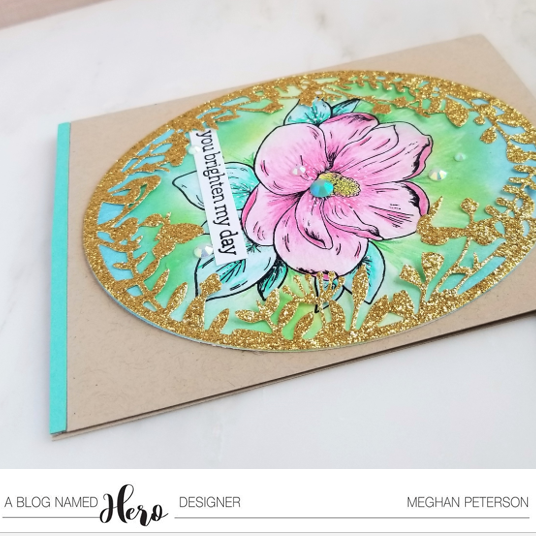 For mine, I decided to do some tropical flowers using an older Hero Arts stamp set that I adore called The Color Layering Hibiscus. For our summer theme I chose some warm vivid yellows, pinks and reds, then some bright teal for our leaves. 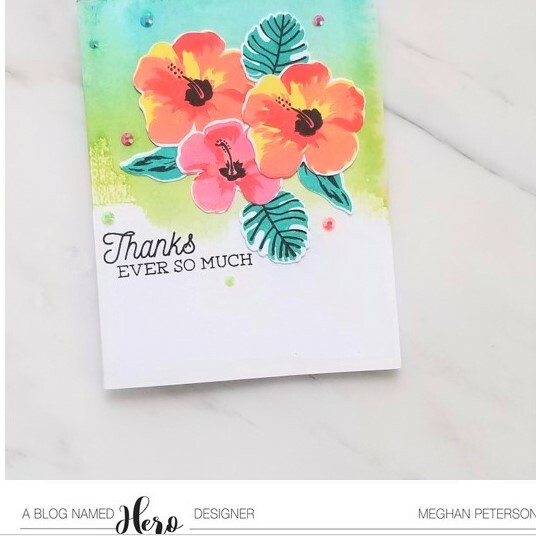 If you want to get an easy graphic look to your layering stamps, use a crisp black for the last layer - it makes them look modern and bright, and I loved doing this technique on these flowers. And for this technique, it doesn't matter quite as much if you get your layers exactly perfect because we're already going for that bold graphic look. If you look closely at my card, you can see I didn't get my layers perfect! After I diecut my flowers and leaves, I wanted to create a tropical watercolor background with greens and blues. 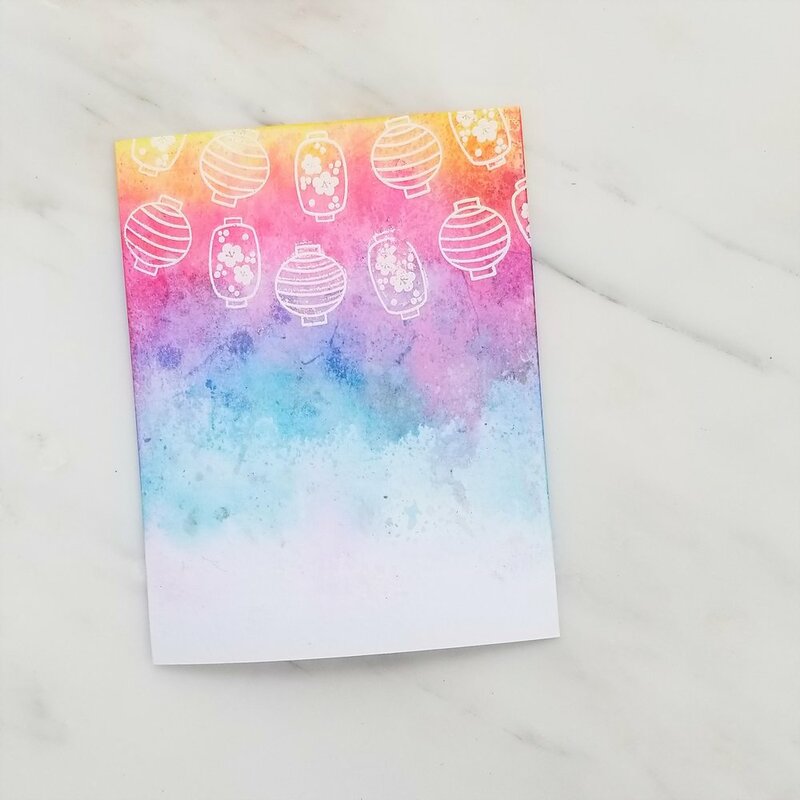 For this, I used one of my new favorite products from Hero Arts, Ombre Reactive Spring Day Ink. You can just smear this as generously or as sparingly as you want, add some water and watch the colors turn to watercolor. It's awesome. I loved it so much, I didn't even add any watercolor touch up to my background. Once I had adhered my flowers in a cluster to my background, I added a sentiment from another of my new favorite stamp sets: Peonies. I added some gems and then sprayed it with a shimmer mist for some extra shine, though it's hard to tell in the photos? 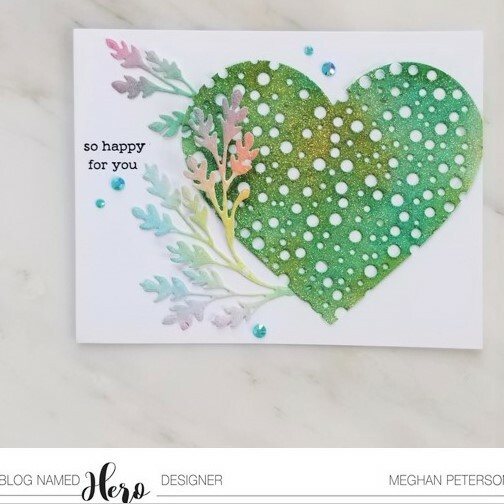 Our card is done and thank you so much for stopping by, and be sure to head over to ABNH to see all the other warm and bright inspiration for this month's challenge, and I can't wait to see what you create! Welcome friends, I am so excited to be here for my first ever ABNH Challenge! I hope that today I provide you with some inspiration for this month's challenge: Use Your Favorite Hero Arts Product. So like many of my fellow designers and I'm sure many of you, picking a favorite Hero Arts product is like trying to pick a favorite movie - almost impossible. 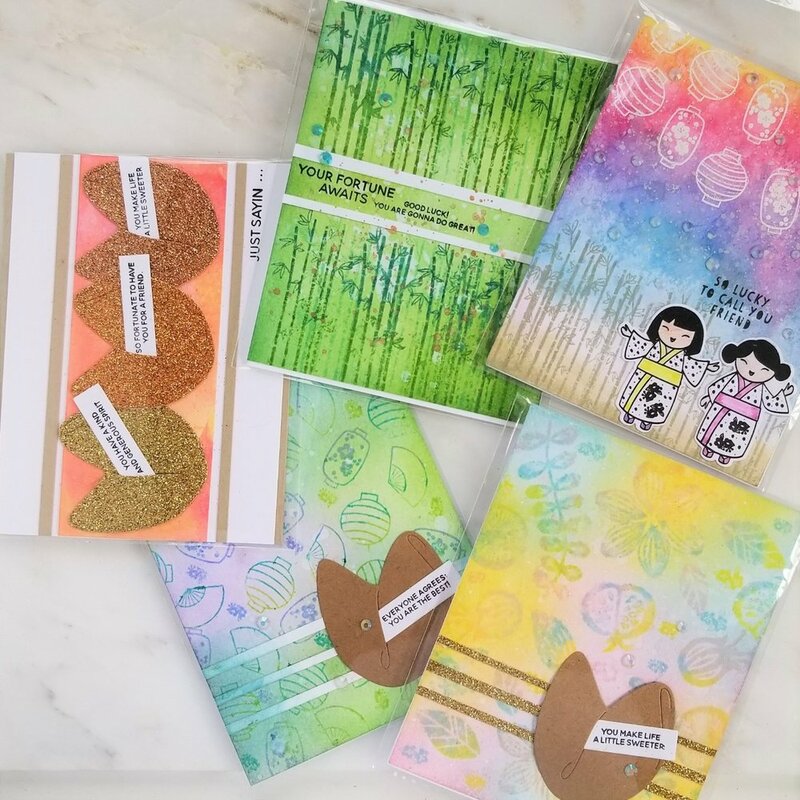 So instead of making myself choose from all the gorgeous stamps and dies, I chose, the Hero Arts Unicorn White Pigment Ink - it is a vivid white pigment ink that can be used with almost all of my favorite Hero Arts products. I hope this is might be a reminder that any small product can be used in big ways! For my first card, I used the Unicorn White Pigment Ink to blend with. 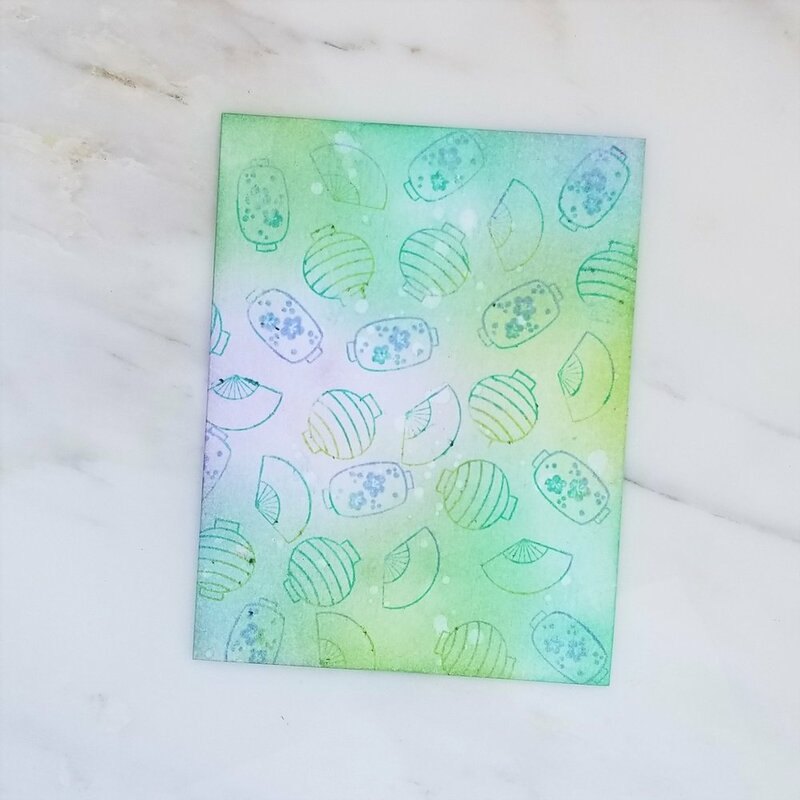 On a special, textured paper from a past My Monthly Hero kit, I blended this white ink using the Large Flower Stencil, which made this beautiful subtle background - more subtle than if you used white embossing powder but adds a soft image to your project. To make this background into a card, I die cut a heart from white card stock and put it in the lower right hand part of my card. This heart comes from the Infinity Heart die set (another favorite of mine!). Then I die cut a partial wreath branch from gold glitter card stock and glued it behind the heart. I only glued parts of the leaves down, to help give the card some more dimension. For the butterfly, which is from the Color Layering Swallowtail stamp and die set, I used Hero Arts ombre ink pads to give the butterfly even more color. The sentiment is also from that same stamp set. I added a few gems, and this card is complete! For my second card, I decided to use this ink for stamping to create a subtle look on a background in a different way. This ink shows up best in stamps with bolder lines or more surface area. If you use it with fine lined stamps, you'll get more of a texture on your card stock rather than a very visible image. First, I blended three distress inks over card stock a random pattern. We want to be heavy-handed with this, as the brighter the colors, the more visible our white ink will be. I then stamped the background images of a rose and leaves from the Color Layering Rose stamp set with the Unicorn White Pigment Ink. You can see in my background where the color was heaviest, the white showed up the best. I love the subtly and texture this adds to an others bold background. 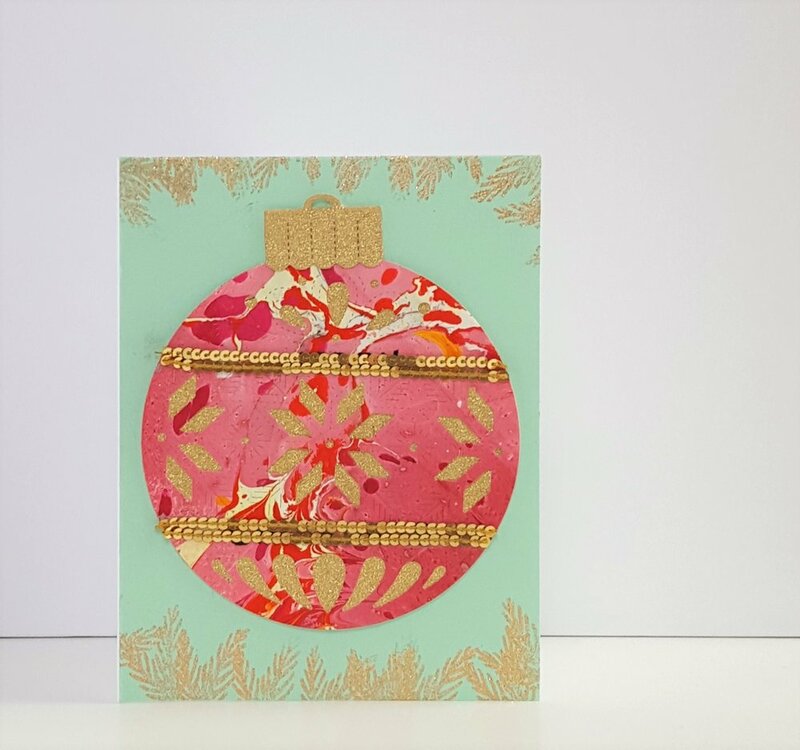 To finish off this card, I die cut and stamped the top layer of the Color Layering Rose leaves. I added these behind the word "love" which I die cut twice from black card stock. 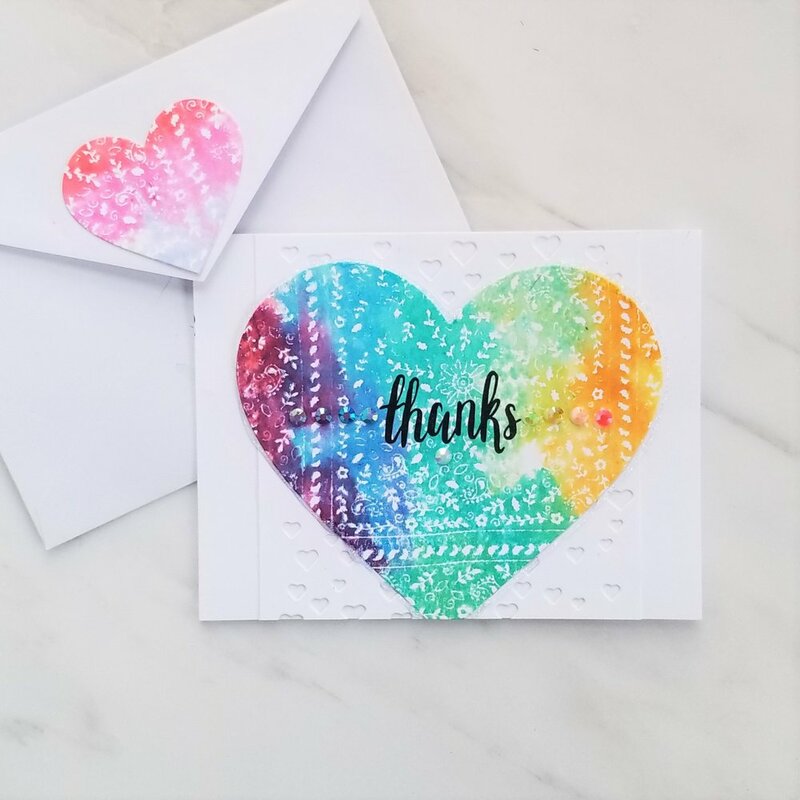 The "Love Stamp & Cut" set has both the "love" die cut and our stamped sentiment. I added some white gems scattered between our background images, and this card is done! Thanks so much for stopping by today, and I hope you join us in this challenge, the possibilities are endless! Neenah Solar Crest White 80lb. Just popping in to announce the winner of the $50 Ellen Hutson gift card! Thank you for stopping by and all of your lovely comments - they meant so much to me! Marianne, please send me your email address so EH can get your gift card to you! You can email me at periwinklestudiodesign@gmail.com. Thank you again to everyone! I'll be back soon! I'm back after a month's hiatus! Still working out the scheduling of my blog, and also the holidays and my boyfriend's upcoming finals are taking over a bit! I wanted to focus today on making holiday/Christmas cards with supplies not designed specifically for the holidays. 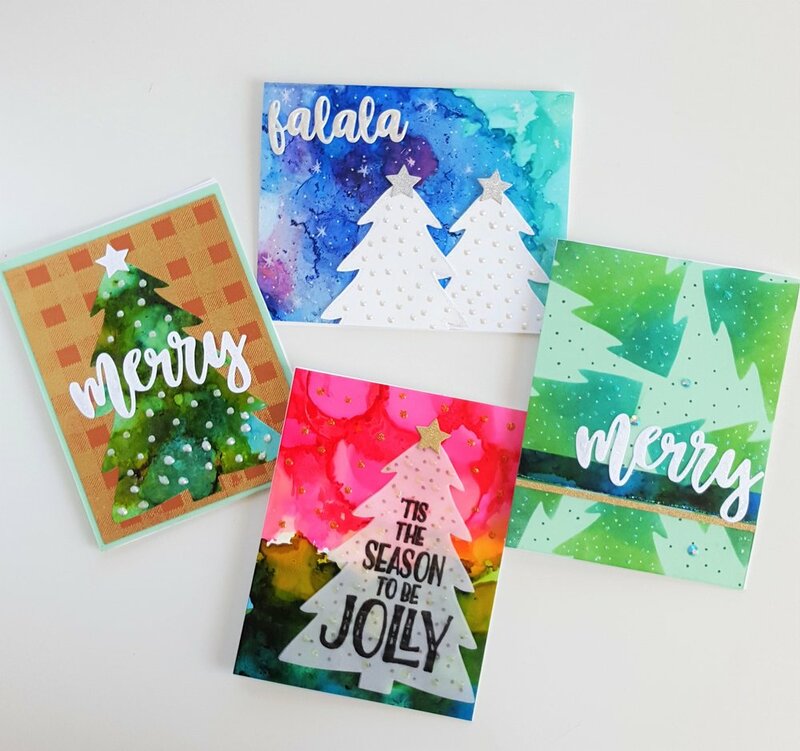 Christmas stamps and dies are super fun, but sometimes you just don't have the time or money to get new specific supplies, that you can only use a couple months a year. 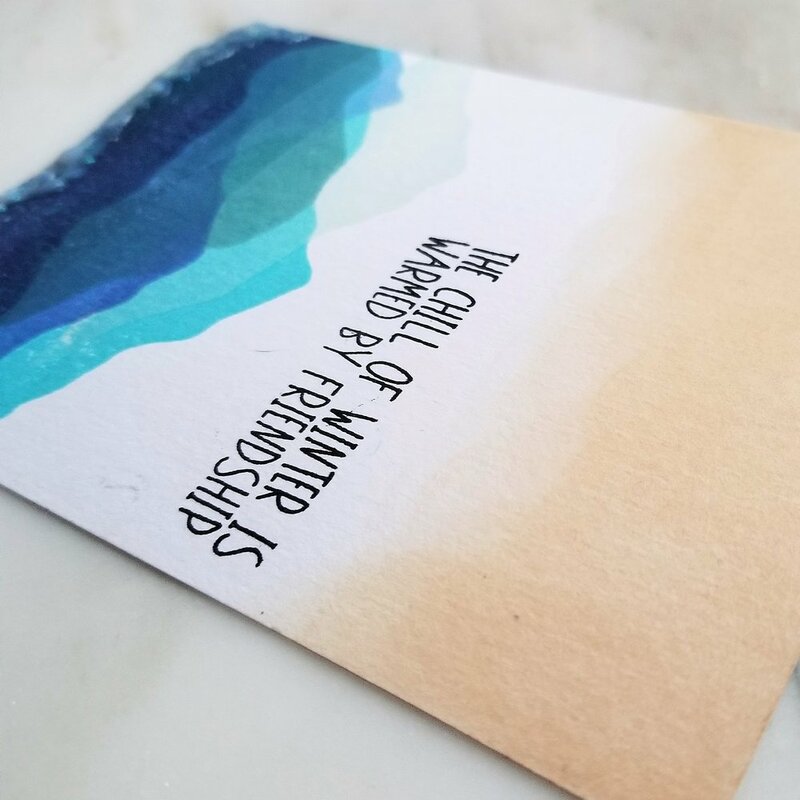 So I wanted to share with you what I look for in my existing supplies for holiday cards, and how I turned them into holiday cards! Please note that for this post, I have used mainly Altenew stamps, stencils and dies, but you can use any similar supplies. This post was *not* supplied by or requested by Altenew. 1. potential Christmas patterns: polka dots for snow, stripes & plaid, trees that could create a winter scene, etc. 5. any embellishments that could be used for snow, berries or holiday decoration (red or green gems, pearls, white embossing powder for snow, etc.). 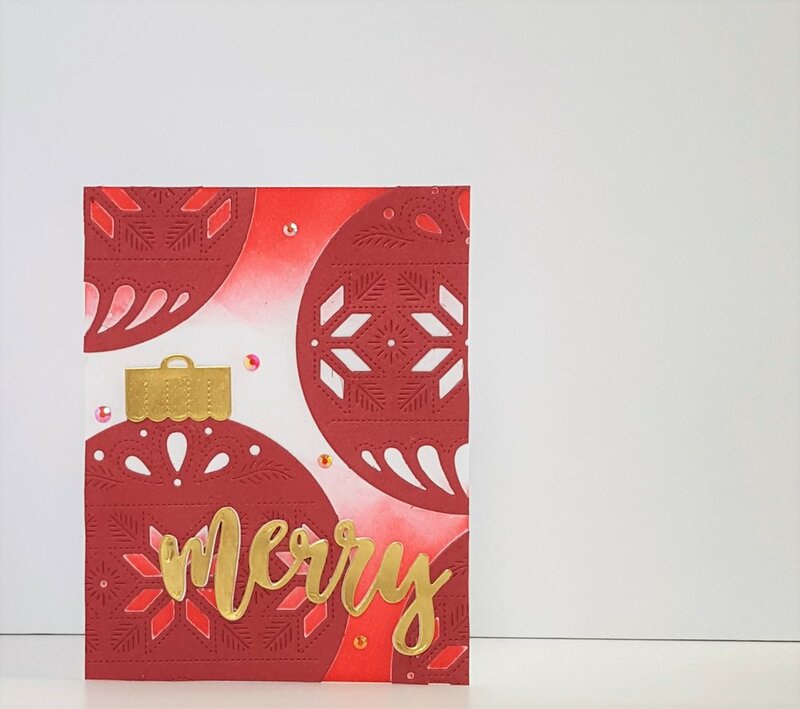 For my first card, I combined a leaf cover die, specialty paper, red embellishments and alphabet dies to create my Christmas card. 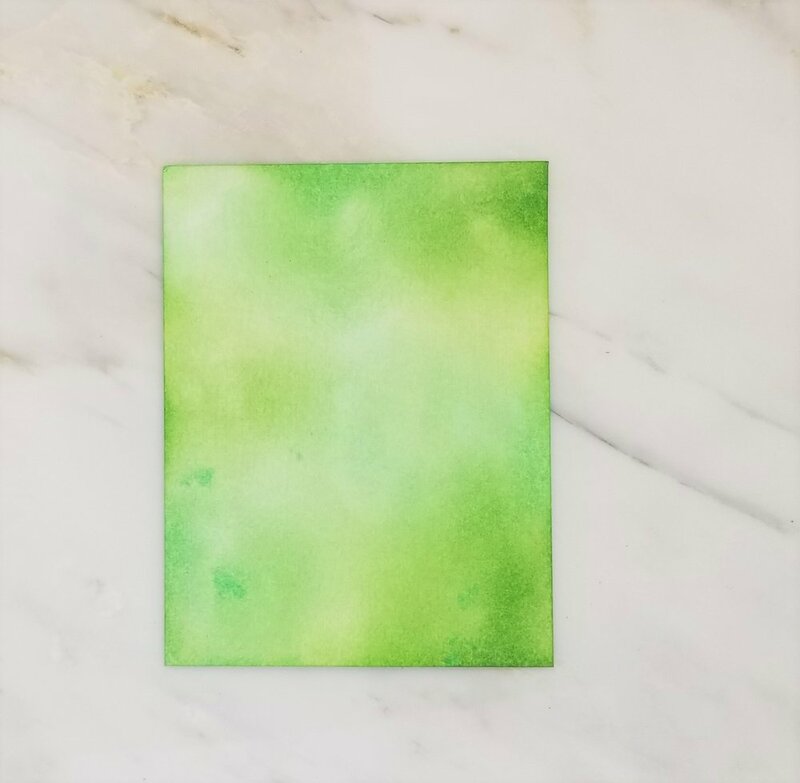 I did some green watercolor on some watercolor cardstock, and then die cut the leaf cover die from it. I also used it to cut white card stock to layer underneath our green paper to create dimension. I then adhered them both on top of silver glitter card stock for some extra holiday shine. I then flicked water on the watercolor paper to create some spots that could emulate snow. Then I die cut the letters for "peace" twice, once from gray and once from white. I glued the gray behind the white for a bit of a shadow effect, and then painted the white letters with Wink of Stella for some shimmer. Then below "peace", I added 5 red gems for some extra traditional Christmas colors. 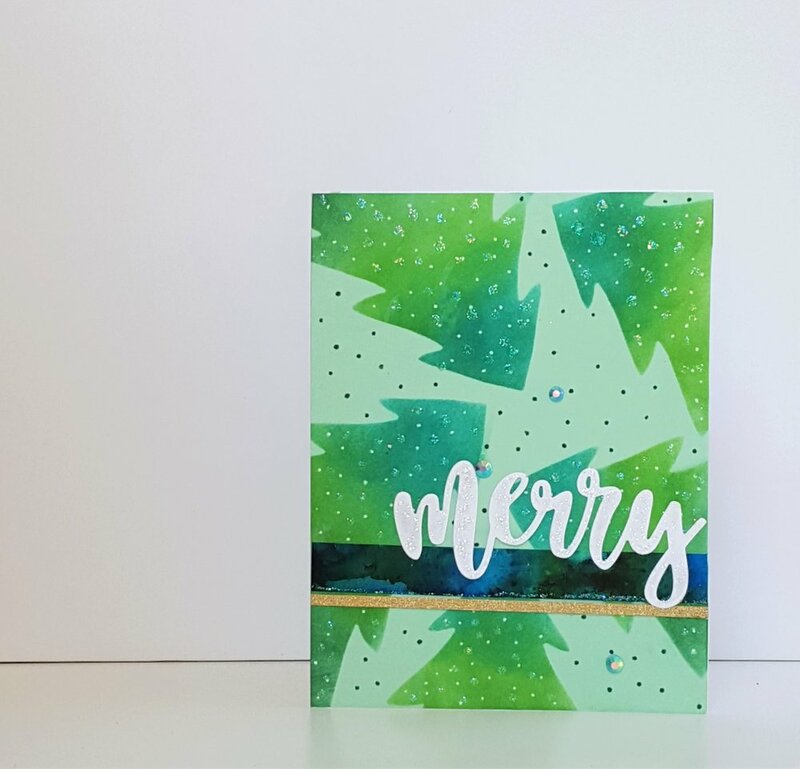 For my second card, I found stencils that were generic enough to look like Christmas flowers and used Christmas colored inks to make it obvious they were holiday flowers. This a set of two stencils, with one that adds depth and details to the outline image. I used reds for the flower, and greens for the leaves for traditional Christmas colors. I then added white shimmer watercolor in drops to look like snow. For some extra shine and dimension, I added some pearl Nuvo Drops and some sequins. I then used an alphabet stamp set to say "Merry Christmas" and "Happy Holidays" on another. Sometimes just the right colors and some snow effects are all you need to turn a non-holiday flower into a Christmas card! 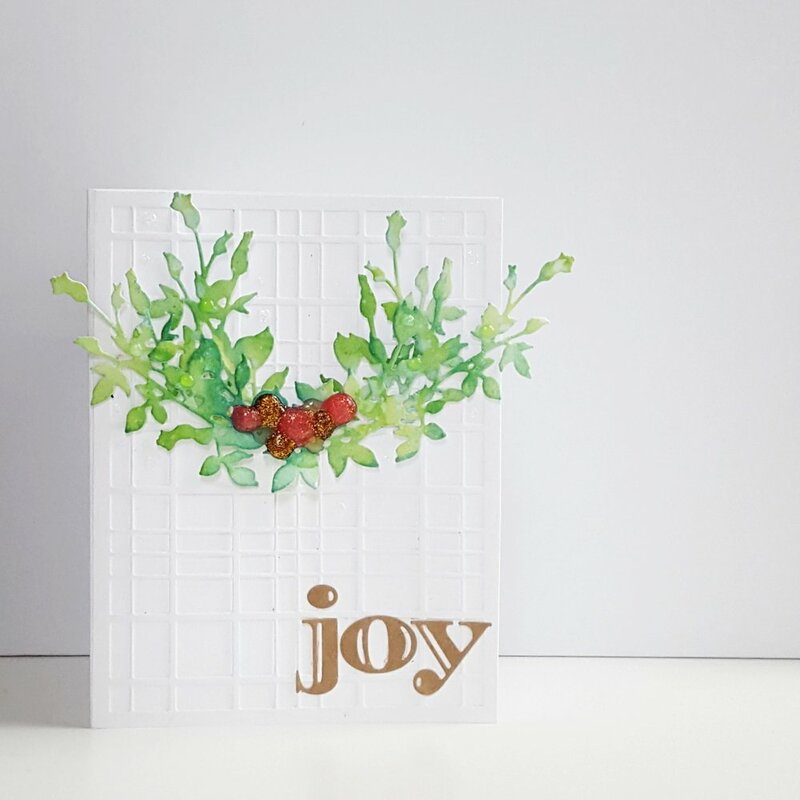 For my last card, this was an experiment for using Nuvo Drops as holly berries. This means they needed to be much bigger than I normally use Nuvo Drops and bundled near each other. For this try, I applied all the different colors of berries at once. However, this meant that some blended together a bit and lost their nice round shape. When I make this card again, I will wait for each set of berries to dry before adding the berries that will be touching the others. But I wanted to show you this card anyway, even though it isn't perfect! I used this plaid background die for a white on white texture look, and then painted this garland die different greens, and layered it together to create a half-wreath or the leaves to a holly berry. Then I applied the Nuvo Drops as I mentioned before in dark pink and gold. I then die cut letters out of Kraft cardstock to spell "joy". When I re-make this card, I might move the joy closer to the focal point, but I'm not sure yet. But I think this card design has potential! That's it for now! I hope this was inspiring to see what you can do with your regular supplies to turn festive! 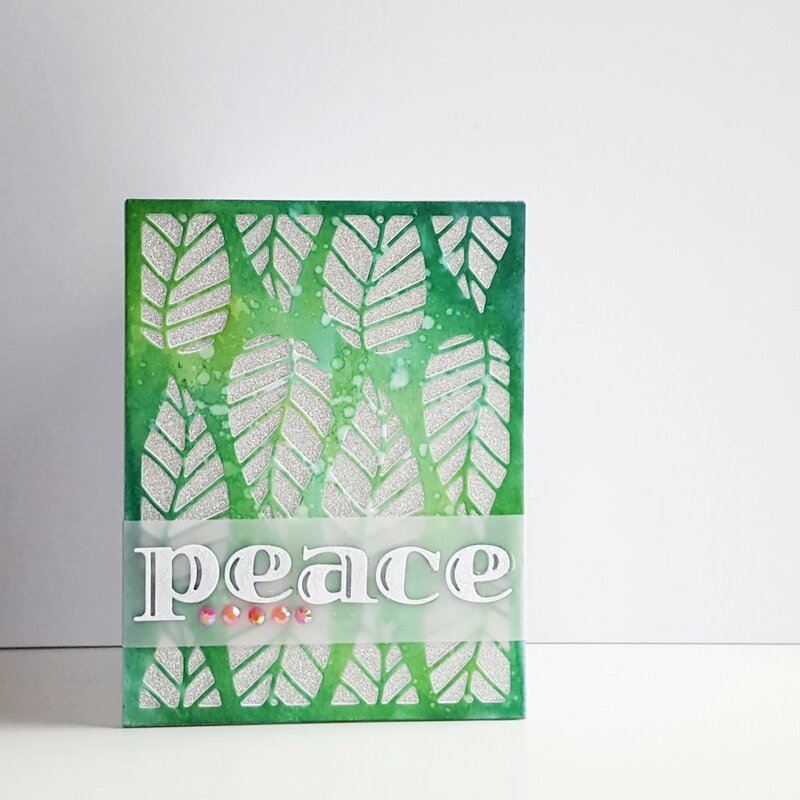 And of course, you can make tropical Christmas cards by adding white embossing powder to palm trees or have it snowing over the ocean, or whatever your heart desires. I highly recommend alphabet stamps or dies so you can turn any card into any sentiment you want though. Hope you're all doing well, and sending you love, peace and joy! Today is my last Friday as Guest Designer for Concord and 9th, and I've been so honored to be a part of this! This stamp and die set is one of my favorites, especially because it works so wonderfully for the holidays and all other times of the year. And then of course, it's so smart because there are so many variations you can get with just one stamp set. Let's dive in, yes? My first two cards are a good example of how you can get two cards from one background. 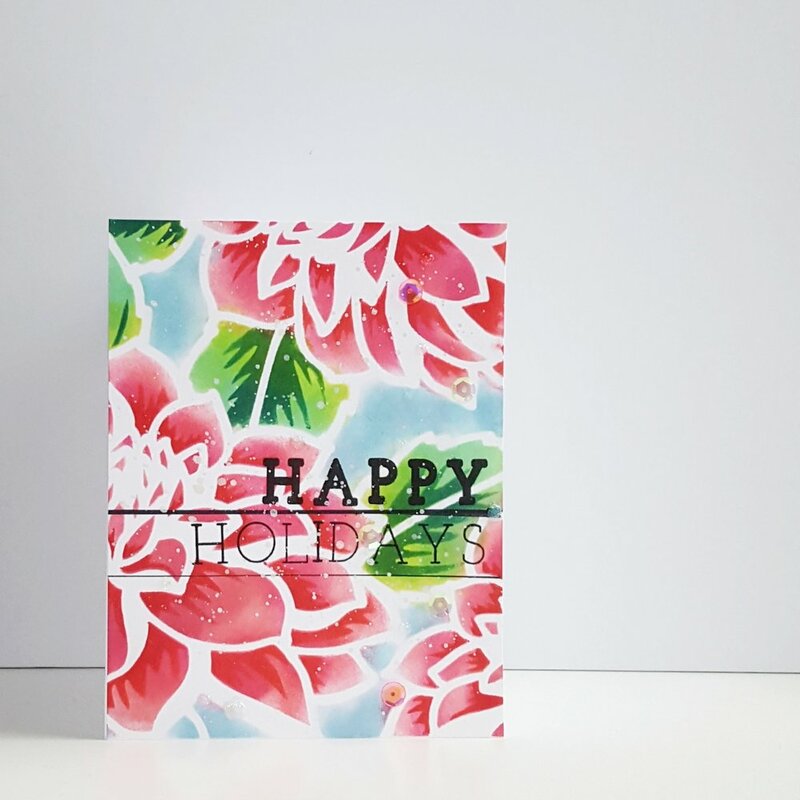 I created this background by stamping with mint green ink and then filling in the flowers to look like poinsettias. I added gold nuvo drops for a festive flare and let that dry. I then die cut out the window using the die in the set. From that, I die cut out one of the flowers to use on my second card. For my second card, I used the plaid background, which allows to create detailed plaid backgrounds super easy. I then die cut out the frame with white and added the flower I die cut from the previous card as an accent. I used the black edged stamps in the kit to add definition to the frames. I then added a few nuvo drop accents. For my next two cards, I used the background stamp with a watercolor effect. I stamped it with varied colors of distress inks and then spritz it lightly with water so the colors would blend together. 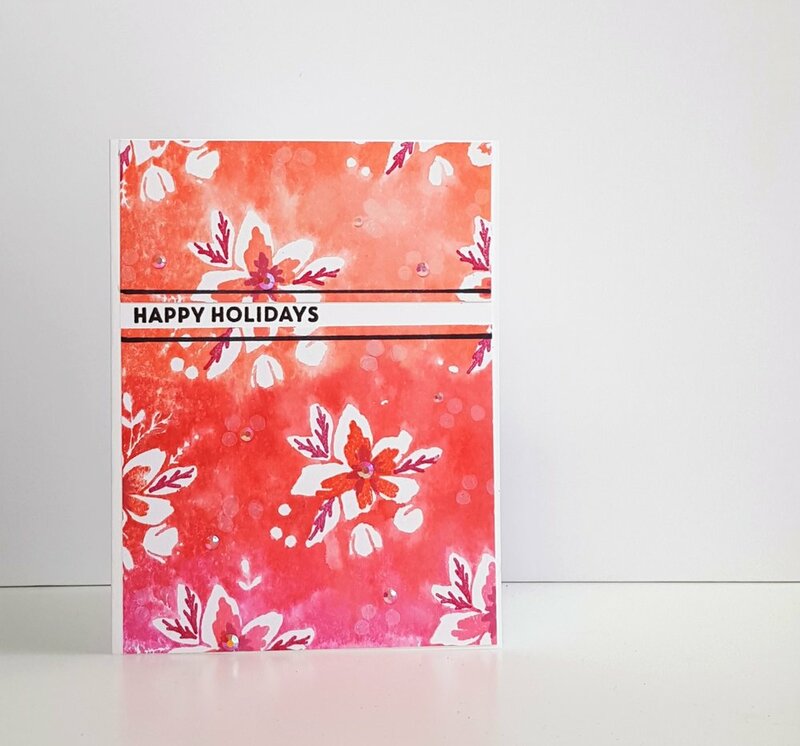 This gives a pretty soft look, and then stamped with coordinating colors in the flowers. I cut the panels in half and added some dots in white ink and some rhinestones. For the next card, I added some dark blue ink as accents instead of the white dots and some rhinestones, which gives it a wintry effect. For both cards, I added some black lines to high light the sentiment and break up the background a little bit. And I think both turned out really pretty! This technique could be used with fall or spring colors as well! For my last project, I wanted to highlight the frame die cut in the bundle, which I think could be a great shape for gift tags. I stamped a red plaid background, die cut out two tags and added "merry and bright" from the Ornamental Stamp set. And you have hand made tags! That's it for my Christmas projects! Make sure to go Concord and 9th's Blog to see all the other inspiring projects! Thanks so much for joining me today, and I hope to see you soon! Hello and welcome back! Thanks so much for joining me today! 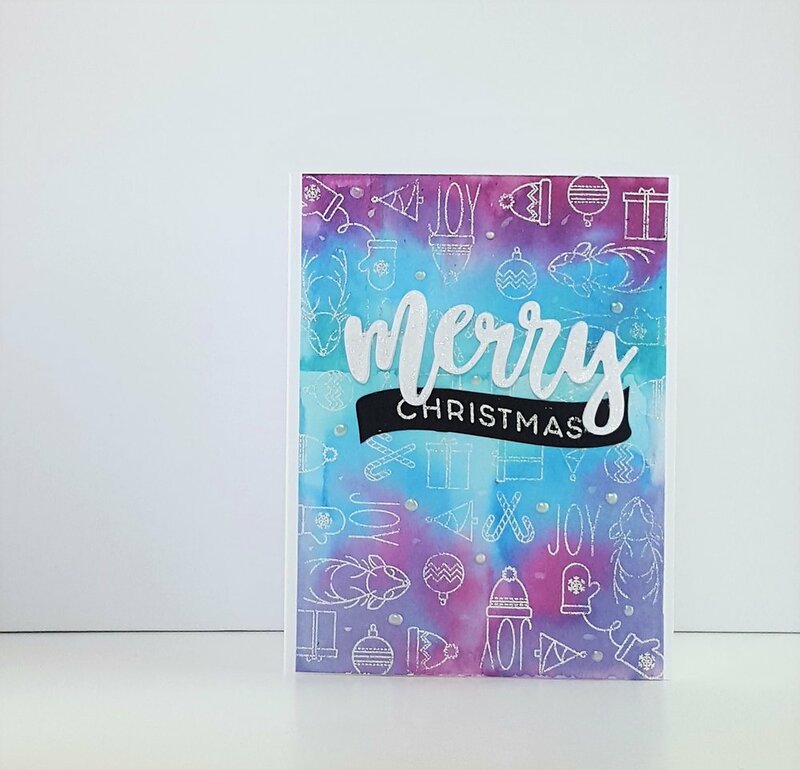 Today's post will focus on how to style a card with a busy background you have created. Often times we create a beautiful background but are not quite sure how to style it or give it a good focal point. In this post, we will be focusing on type of style - there will be future blog posts that will be about different ways to style intense backgrounds. We will be looking at two cards today - one with a bright colorful background and one with an intricate but neutral-colored background. First up is a bright and layered background. I made this background by stamping eight layered sunflowers from the Hero Arts' September monthly kit onto white card stock. I die cut them out using the coordinating dies, and layered them over a 4 1/4 and 5/12 white piece of card stock. 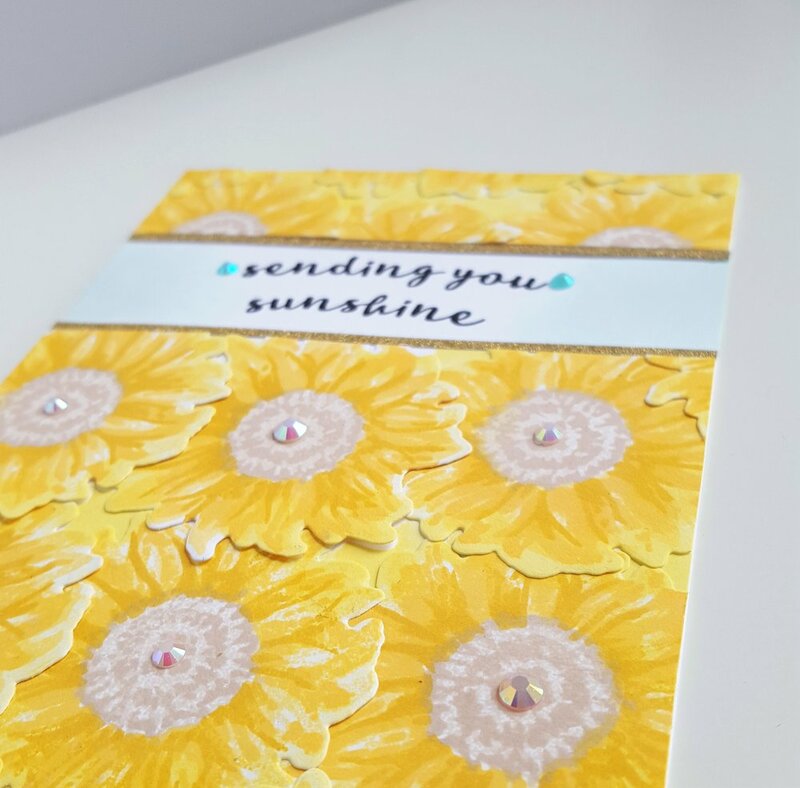 Any sunflower petals that overlapped from the card stock, I cut off and then used to fill in any gaps around the edges of the card as needed. After making sure all the sunflowers were adhered securely (if you use a liquid medium, make sure it is fully dry before the next step), I cut out about 1 inch of the sunflowers in the middle of the card. I then glued the two remaining pieces onto a 4 1/4 and 5 1/2 white piece of card stock, leaving the gap I cut out in the middle. (I used the piece I cut out to create a second card!). I then cut two strips of 1/8 inch gold glitter card stock to glue up against the edge of the two sunflower pieces. I then stamped the sentiment "sending you sunshine" from the My Monthly Hero Kit in the center of the white space. I used a small ink blending tool to blend a light aqua on the edges of the white strip for some added color. Finally, I added some Lucy's Cards gems to the center of each sunflower and on either side of the sentiment. This style allows the sunflowers to stand out while also allowing the sentiment to be clear and uncluttered. It also gives the card a broad focal point. The next card's background is on Kraft paper with intricate white embossing. Another busy background, but more neutral and is not necessarily the main point of the card. For my second card, I trimmed about half an inch from the top and the bottom of the panel, instead of cutting a strip from inside the card. This allows me to cut the card in half where the center of the stamp is, to act as a radiating focal point. I then glue the bottom panel to the bottom edge and the top panel to the top edge of the 4 1/4 and 5 1/2 white piece of card stock using craft foam, to give it some dimension. 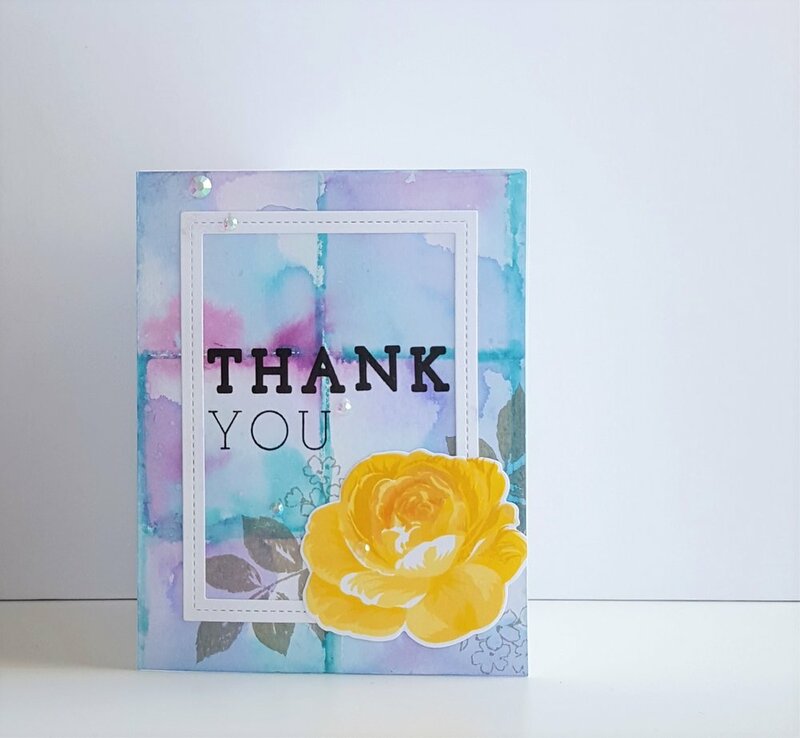 I then stamped the layered flower bunch and a leaf from a SSS Stamptember collaboration with Clearly Besotted, and fussy-cut it out. 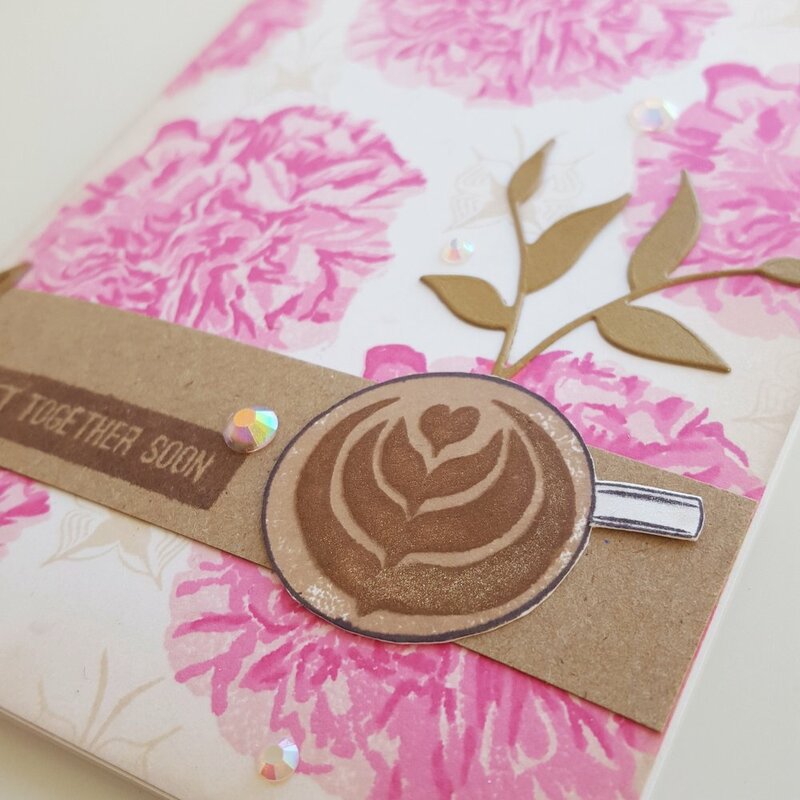 I then added the flowers and leaf to right edge of the white strip to create a focal point for the card. I put a piece of foam tape behind the flower to make sure it wouldn't buckle in the mail. 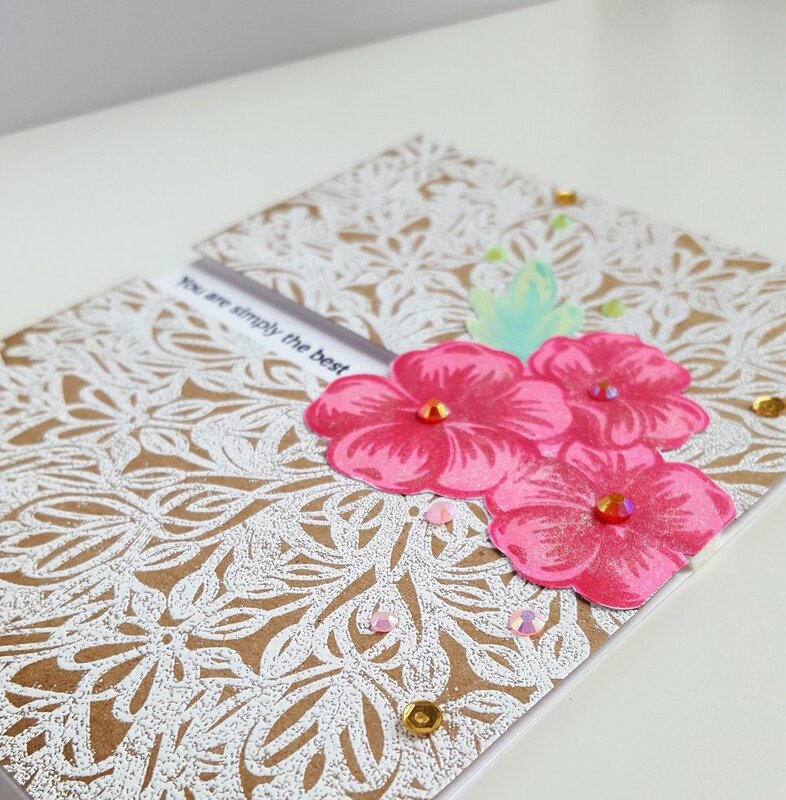 I then stamped the sentiment from a SSS stamp set in black in the white strip, and addedWink of Stella and Lucy's Cards gems and sequins to the flowers and around the flowers to emphasize the focal point. I then used an ink blending tool to blend a light brown ink on the edges of the card to give the edge some definition. 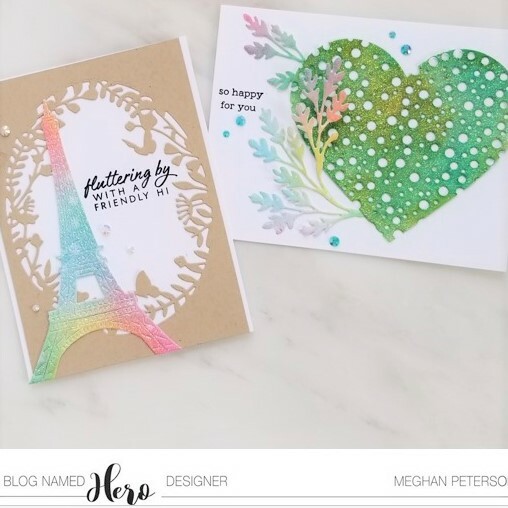 This technique works well if you do not have die cut sentiments but want a busy card. There are many other techniques for busy backgrounds and I'll explore those later. I hope you liked these cards and hope you liked this design! Thanks so much for stopping by!